Victor & Victoria’s Pet Town A learning tool to assist kindergarten and primary school children in responsible pet ownership and dog safety. Explore Pet Town, try the activities and earn rewards for Victor along the way. Collect them all and you will gain access to the Pet Club where you can download printable stickers, colouring sheets, music and a whole lot more! Download the application for iPad or Android devices. Why is responsible pet ownership and dog safety important? Owning pets can be a lot of fun, and pets can provide us with company, stress relief and unconditional love. Pet ownership also teaches children responsibility, and helps them develop their social and nurturing skills. Pet Town and who is it for? Victor and Victoria's Pet Town has been developed by the Department of Environment and Primary Industries to help young children learn about responsible pet ownership and living safely with dogs. As part of the Victorian Local Government's dog and cat registration process, they are required to collect a small levy on behalf of the State Government. Part of this levy funds the State Government's Responsible Pet Ownership Programs. Pet Town supports the Victorian Government's Living Safely with Pets Primary School Education Program and the Living Safely with Dogs Kindergarten Program. As well as having lots of fun things for kids, Pet Town includes information for teachers and parents. We focus on children aged between four and twelve years of age. Pet Town reinforces the knowledge and understandings taught by the program’s Pet Educators during school and kindergarten visits. It also supports key teaching points and curriculum outcomes outlined in curriculum and resource kits, which we provide free of charge to all Victorian kindergartens and primary schools. 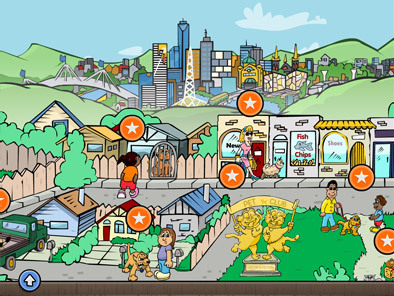 Pet Town has been developed on behalf of the Department of Environment and Primary Industries by Fraynework.